Drop the fork. This is the birthday cake of all cakes. I’ve made it twice and it’s turned out to be a crowd pleaser both times. 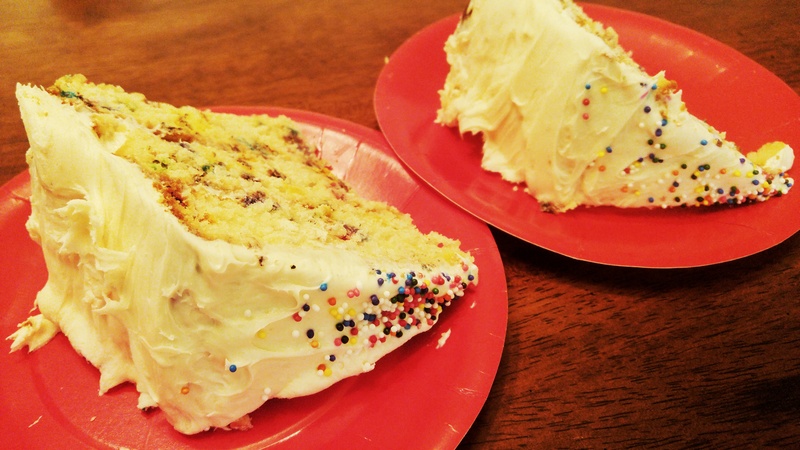 It’s Blog By Tracy’s first birthday and this cake recipe is for you! 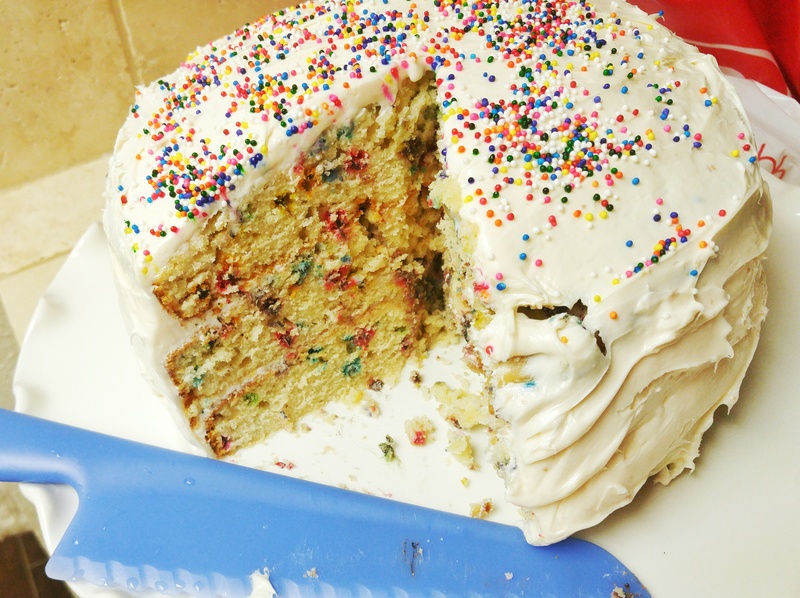 It’s a Funfetti triple decker. Now don’t let that scare you like it did me because there’s nothing to it. Trust me. I used to think that layer cakes came from bakeries only. Not so, this one is so easy even I can do it. Pin it, print it, and file it away for the next birthday celebration. 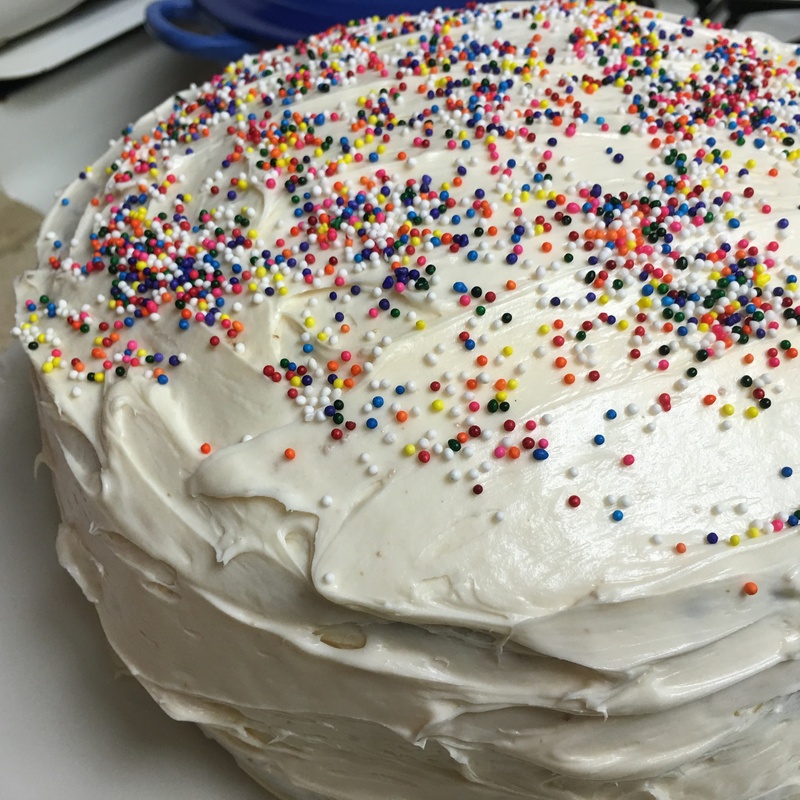 Your guests, family and friends will love this buttery cake with fun birthday sprinkles inside and so will you! *I tried this recipe the first time and did not sift the dry ingredients. It is true that if you don’t sift the cake comes out very dense. The second time I did sift and it improved the texture. **I used 1 full cup of sprinkles to make it more festive inside. ***No stand mixer, no problem. Get out the old mixer with two beaters. That does the trick. ****The second time I made this cake I was pressed for time and picked up 2 cream cheese icing canisters. No one knew the difference. Make the cake: Whisk the sifted flour, baking powder, baking soda, and salt together in a large bowl. Set aside. Using a handheld or stand mixer fitted with a paddle attachment, beat the butter on high speed until smooth and creamy – about 1 minute. Add the sugar and beat on high speed for 5 full minutes until creamed together fairly well. Scrape down the sides and up the bottom of the bowl with spatula. On medium-high speed, add 1 whole egg at a time, beating well after each addition until all 4 whole eggs are mixed in. Set the 2 egg whites aside for now. Beat in the vanilla extract. Scrape down the sides and up the bottom of the bowl. In 3 additions alternating with the buttermilk, add the dry ingredients with the mixer on low, beginning and ending with the dry ingredients, and mixing each addition just until incorporated. Be super careful not to overmix. The batter will be smooth and a bit thick. Vigorously whisk or beat the 2 additional egg whites until thick, foamy, and soft peaks form- about 3 minutes. Gently fold into the batter. Fold the sprinkles into the batter very gently. Spoon/pour batter evenly into each cake pan. Bake for around 25 minutes or until toothpick in the center comes out clean. I’m notorious for rushing the cakes out of the pan. Resist. Let the cakes to cool all the way before applying icing or handling the cakes at all. In a large bowl using a hand-held mixer or stand mixer fitted with a whisk or paddle attachment, beat the butter on medium speed until creamy – about 2 minutes. Add powdered confectioners’ sugar, cream, vanilla extract, and salt with the mixer running on low. Increase to high speed for 3 minutes. If it’s too think, add more confectioners’ sugar or more cream if frosting is too thick, or a pinch more of salt if frosting is way too sweet. Remember better to add than to take away. Put 1 cake layer on your cake stand or serving plate. Evenly cover the top with frosting. Top with 2nd layer and evenly cover the top with frosting. Finish with the third cake layer and spread the remaining frosting all over the top and sides. You can tint the icing with a drop of food coloring to get your desired color if you’d like. Decorate top of cake with sprinkles for birthday fun! Top with candles or fun toppers and you’re done! The original recipe is from my favorite Sally’s Baking Addiction. Let the birthday party begin! This looks so good! I know its a birthday cake, but I am going to use it for a graduation celebration, yum!